"The Effects of Temperature on Political Violence: Global Evidence at the Subnational Level"
Statistical results showing that absolute temperature level is significantly and positively correlated with incidence of conflict around the world. 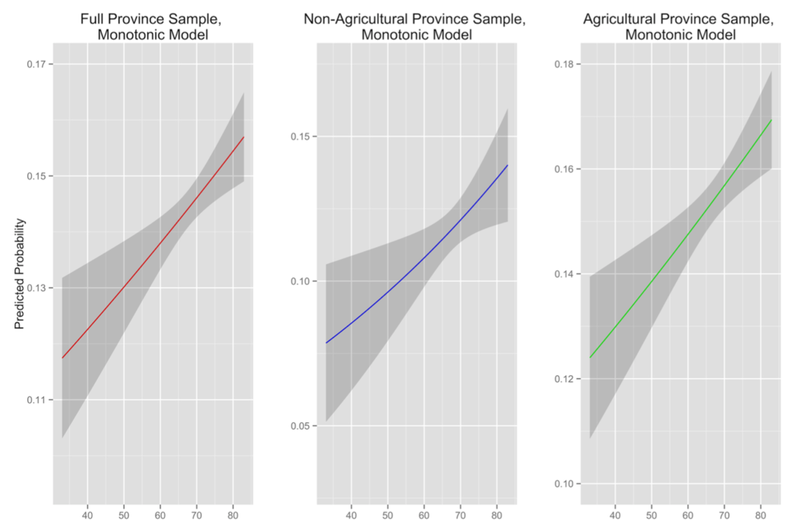 This relationship manifests in both non-agricultural and agricultural sample provinces. A number of studies have demonstrated an empirical relationship between higher ambient temperatures and substate violence, which have been extrapolated to make predictions about the security implications of climate change. This literature rests on the untested assumption that the mechanism behind the temperature-conflict link is that disruption of agricultural production provokes local violence. Using a subnational-level dataset, this paper demonstrates that the relationship: (1) obtains globally, (2) exists at the substate level — provinces that experience positive temperature deviations see increased conflict; and (3) occurs even in regions without significant agricultural production. Diminished local farm output resulting from elevated temperatures is unlikely to account for the entire increase in sub- state violence. The findings encourage future research to identify additional mechanisms, including the possibility that a substantial portion of the variation is brought about by the well-documented direct effects of temperature on individuals' propensity for violence or through macroeconomic mechanisms such as food price shocks. 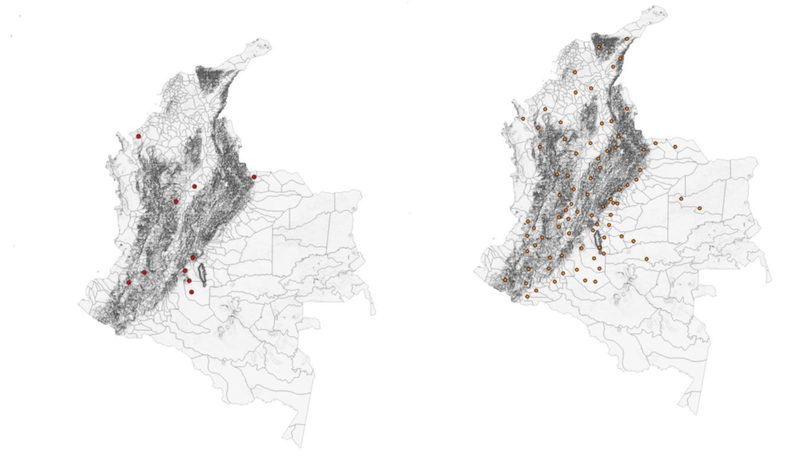 "Places to Hide: Terrain, Ethnicity, and Political Violence"
Terrain ruggedness and the location of Fuerzas Armadas Revolucionarias de Colombia bases in 1964 (left) and 1995 (right). Terrain is central to understanding why some countries have contentious ethnic divisions, while others do not. We argue that access to variable rugged terrain facilitated the development and survival of more distinct ethnic groups, even in the face of government repression. The persistence of greater ethnic diversity in highly variable rugged areas as well as the tendency for these ethnic groups to be politically excluded is also associated with civil war. Specifically, ethnicity mediates some of the eect that terrain has on civil war, a point overlooked by most of the literature. Using province-level geo-coded data on civil war, terrain and both the distribution and political status of ethnic groups, we demonstrate that rugged variable terrain directly and indirectly aects the incidence of civil war. A substantively important proportion of terrain's effects on civil conict are transmitted indirectly through the distribution and exclusion of politically relevant ethnic groups. Invited for revision at the Journal of Politics. 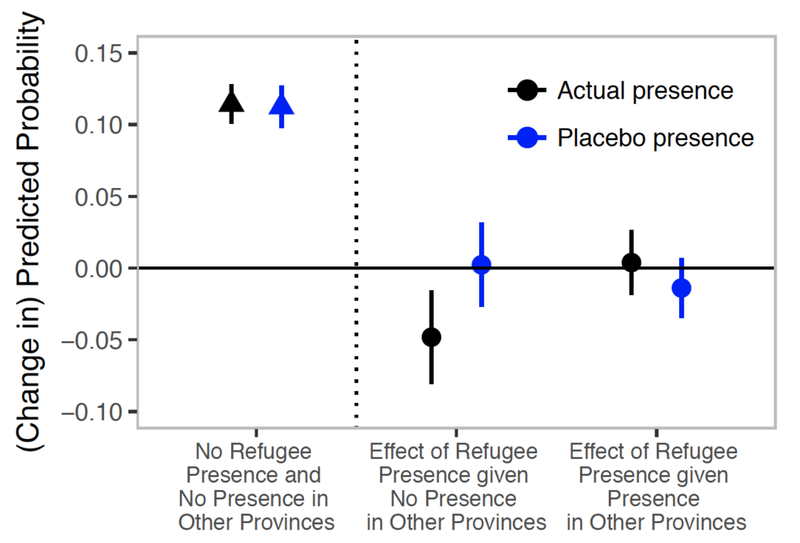 Statistical results showing that, contrary to population belief, those subnational areas of the world that receive refugee communities experience a reduction in their subsequent conflict likelihood.